Watch Out for Wasps This Spring and Summer! Now that spring has arrived, many people will start thinking about getting the garden in order and enjoying the great outdoors. However, spring can also bring with it some unwanted pests, including the wasp. This is where Essex and Suffolk Pest Solutions comes in. Insects often plague visitors to seaside resorts over the spring and summer months, and we can solve your wasp problem in Clacton, Frinton, Harwich and Felixstowe. We offer our services not just on the coast, but in other towns and villages across the area too. Here are a few facts you may not know about wasps, including some of the more unusual places where their nests have been discovered. Social or Solitary? : Wasp species fall into one of these two categories. The solitary type does not build a nest but the social one will, and sometimes nests can be inhabited by 5,000-10,000 insects at a time. Dealing with such enormous numbers shows how important it is to call in wasp control experts rather than trying to deal with a nest yourself. Health Dangers: Wasps are a serious pest – their sting can not only be painful for humans but also, in a very few cases, lead to the onset of anaphylactic shock. This extreme reaction can ultimately lead to cardiac arrest. Girl Power: The queen wasp has a crucial role in the life cycle of the whole species. She relies on her own body fat to live through the winter months. By contrast, the male wasp does not hibernate and therefore does not survive. The queen is also responsible for laying all the eggs, and for starting a new nest. Unlike male wasps, the female can sting, and is therefore given the responsibility of guarding the nest. Nest Building: These insects’ nests are originally built from wood, which is stripped by the insects from places such as fence panels and garden sheds. This is then converted into a paste by the larvae of young wasps which the adult workers then use to keep expanding the nest. Unusual Nesting Places: Nests are generally built in places like attics and garden sheds, as they are places where wasps can often breed, feed and remain relatively undisturbed. Loft spaces are often chosen, as they usually find them easy to get into. However, nests have also been discovered on ladders, in watering cans, on pairs of hedge cutters, inside a car engine, inside the bedroom of a doll’s house and even in a bedroom, on top of a quilt. This last one went undiscovered for a period of time because it was in a guest room which was not used very often. All for One: When a wasp dies, it lets out a pheromone in the air which acts as a warning to other wasps. So be wary if you kill one, as you may find yourself attacked by others who have come to the aid of their fallen comrade. Wine Producers: Wasps can actually help produce your favourite tipple. This is because some female wasps can store wild yeasts in their gut over the winter months. After hibernation, they feed on grapes the following year, and the yeast helps to begin the fermentation process. Not Just Nectar: These insects do not just feed on nectar and apples that have fallen from your tree. As omnivores, they will also eat carrion and other insects, such as large caterpillars. Wasps help pollinate plants and will eat caterpillars. When to Watch Out: Wasps are not nocturnal creatures. This means they carry out all their activities during the day and always return to the nest at night. During the year, wasps are most likely to bother you during the summer months, when their food habits change. It is during this period that they are more likely to attack humans. If you have a wasp problem in your home or business, then fully qualified professionals Essex and Suffolk Pest Solutions are the people to call. We offer wasp control solutions in Clacton, Colchester, Manningtree, Basildon, Sudbury, Ipswich, Stowmarket and Woodbridge and other towns and villages across the area. 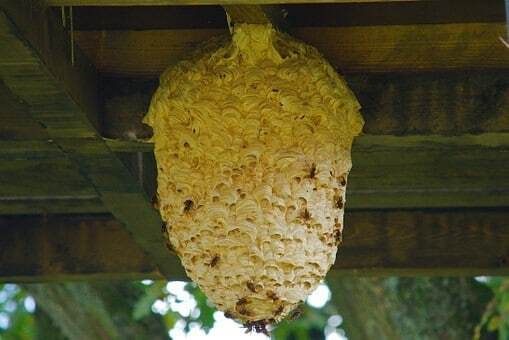 If you need expert wasp nest removal or other pest control services, click the link above for more details. ‹ What Do You Need to Know About Bed Bugs? I’m sorry to hear that you have ants in your garden Soo. If you would like our assistance with this problem please do not hesitate to give us a call on 01473 328092.